Is Jim Benning the Vancouver Canucks' newest GM in waiting? Home/Featured/Is Jim Benning the Vancouver Canucks’ newest GM in waiting? Since Mike Gillis was fired as the Vancouver Canucks’ General Manager back in early April, rumours have been swirling around current Boston Bruins assistant GM, Jim Benning. A former Canucks defenseman and teammate of Canucks President Trevor Linden, Boston has given permission for Benning to be interviewed for a week. Another candidate for the job is Nashville Predators Assistant GM Paul Fenton, but Benning appears to be the front-runner. According to Darren Dreger, Benning is believed to receive the vacant position, but the Canucks were just waiting for the Bruins to be eliminated. With the Montreal Canadien’s Game 7 victory over the Bruins, it may just be a matter of time before Benning is named GM. Before becoming the Assistant GM in Boston, Benning served as an amateur scout for the Anaheim Ducks (1993–94) and then joined the Buffalo Sabres as a scout (1994–98) and as Director of Amateur Scouting (1998–2004). His experience as a scout could largely benefit the Canucks, who do not have the track record of being a great drafting team. 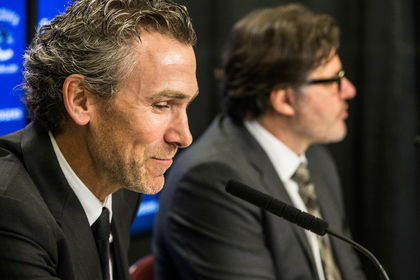 Considering there has been talk of following the Boston Bruins model of building a team, hiring a man that knows all about it might be the smartest choice. It seems to only be a matter of time before Jim Benning is officially name the Canucks’ new General Manager. The Bruins fashioned the league’s best record this season and had the second-ranked power play and penalty kill. And because Recchi knows first-hand that Benning’s strengths are strong leadership, smart draft evaluation and savvy personnel decisions, Linden former Canucks teammate looks like a good fit. He was interviewed by Buffalo in late November to replace fired general manager Darcy Regier — the job went to Tim Murray — because of Benning’s success as the Sabres director of amateur scouting. He had a strong hand in selecting Ryan Miller, Jason Pominville, Derek Roy, Paul Gaustad, Daniel Paille and Dennis Wideman.